or email kimberly@salonindulgencebykimberly.com for our appointment policies. Professional hair cutting and styling services are available from highly trained stylists. From traditional, classic looks to more expressive modern approaches incorporating asymmetry and advanced techniques&hellip using only the finest product of which to educate you with. Our child friendly staff will give your kid the perfect trim in a relaxed environment. Keratin Smooth Treatment in-salon service that infuses natural keratin deep into hair& sealing moisture into the cuticle. This revolutionary therapy eliminates up to 95% of frizz and curl and instantly adds amazing shine, silkiness and condition to the hair. Clients rave that this services a life-changing experience. . Hair is more manageable, smoother and easier to style than ever before. It is perfect on all types of hair including color treated and chemically processed hair! Expert coloring and highlighting services by our professional staff. We provide professional hair coloring and highlighting services using the highest quality products and latest techniques available only through professional salons. Call for a consultation to discuss your hair color goals and develop a plan with your colorist to reach your objectives. A luxurious Hair Treatment specifically for the individuals hair type gently massaged throughout to either maintain color/highlighting, restore and enhance the hairs texture. While receiving this 12 minute service Indulge yourself with an aromatherapy warming neck and shoulder wrap. Facial cleansing, massaging exfoliant scrub and an Organic face mask for the individuals skin type. While relaxing with the mask.... enjoy a warming aromatherapy neck and shoulder wrap. Additional services available, call for specific pricing. *Comes with a complementary Shirley Temple Cocktail! 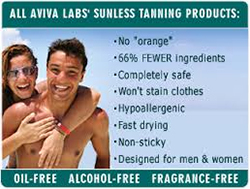 AVIVA sunless tanning is a way to achieve a beautiful, golden brown tan in just one session. Our experienced professionals will customize the alcohol free, hypoallergenic tanning solution to ensure and even, sun-kissed glow that is right for you. The color is natural, fragrance free and fades like a suntan without the damaging effect of UV rays. spray tan parties are available within the salon/traveling upon request! Full body spray tan packages.